It seems we are about to experience the biggest decumbent in the contemporary social media paradigm. Facebook, being at the pinnacle of social media industry for years was considered as the single most authoritative player but this was before its CFO officially confirmed the much rumored trend of teenagers becoming less active on Facebook. The experts were already hinting the deterioration in the use of Facebook amid the flood of other grasping social media outlets, chatting apps, video and content sharing platforms. What’s App, We Chat, Viber, Vine, Instagram, Tumblr, Flickr and other spick and span of the wriggled up market is dwindling the monopoly of Facebook and Twitter. The stats depicting the depreciation of Facebook use among teens are really surprising. Ebersman, the much worried CFO of the social media giant admitted that they have “seen a decrease in the usage of Facebook, especially among the teenagers”. He was referring to the recent surveys done for the Facebook hits around the world for the period of second to third quarters of 2013. Facebook’s anguish is testified by GlobalWebIndex, a leading market survey conducting company. 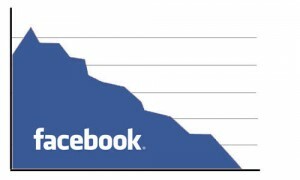 They surveyed the use of Facebook in more than 30 countries and found that Facebook activity graph has depleted by 56% in the third quarter of 2013 which was 76% in the first quarter of the same year. This is really alarming because the rate of decline is swift and exponential. After reading the above stats, you must be wondering where in the world teens are going. No they are not into studies, they are not paying attention to outdoor games nor healthy activities rather some other social media perks are keeping them busy. GlobalWebIndex was generous enough to issue a great self-explanatory info-graphic which depicts which social media apps are grasping the teenagers attention. Have a look. 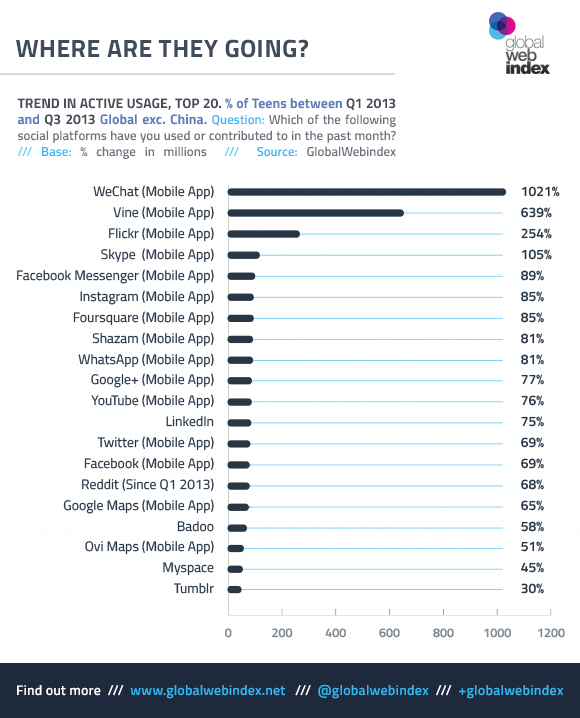 The preponderating bar you see at the top is for the “We Chat” mobile service, an app by Chinese which has a dramatic growth of 1,021% among the teens of 16 to 19 years of age. Vine, Twitter’s social media app for video sharing is hitting the second slot. Flickr by all means is surprising me because there is not much in this for teens except for photo sharing but somehow it’s rated third in the chart having a growth rate of 254%. Mark Zuckerberg’s workplace must be yowling around on these stats. Les hope Facebook comes up with something much spiced up to keep the teens active on Facebook apart from boring likes and hitting the share buttons.